After the Bishop of Digne shows kindness to Jean Valjean, providing him with food and allowing him to spend the night without pay, Valjean steals the Bishop's silver plates and silverware. Caught by the police, Valjean faces life in prison for his latest crime. He is freed from a terrible future when the Bishop tells the police that he gave the silverware to Valjean as a gift (and that he had also given him candlesticks which Valjean had left behind). Stunned that the Bishop would do such a thing, to help him, Valjean listens to the old man when he tells the ex-convict to change his life. Selling the silver goods will give him the financial footing he needs to start again. When he reaches the village of Montreuil-sur-Mer, in northwestern France, Valjean rescues two children from a fire. Their father is the chief of the local police. Another police official - an inspector - also works in the pastoral town of Montreuil-sur-Mer. His name is Javert. Who is this man? As we have said, he had no vices. When he was pleased with himself, he permitted himself a pinch of snuff. Therein lay his connection with humanity. Javert was like an eye constantly fixed on M. Madeleine. An eye full of suspicion and conjecture. In this audio clip, Carole Bos reads from Les Miserables, Volume I - Book Fifth ("The Descent) - Chapter V (entitled "Vague Flashes on the Horizon"). As you listen, consider these topics. What causes a person to lack compassion? How does suspicion or conjecture lead to wrong conclusions or distrust? Les Miserables, Volume I, Book Fifth, Chapter V - "Vague Flashes on the Horizon"
As you listen to Carole Bos read this chapter, you can follow along online. See the translation by Isabella Hapgood (at Project Gutenberg), which is opened to "Vague Flashes on the Horizon." Les Miserables, Volume I, Book Fifth, Chapter V - "Vague Flashes on the Horizon" - by Victor Hugo. Read by Carole Bos, creator of Awesome Stories. 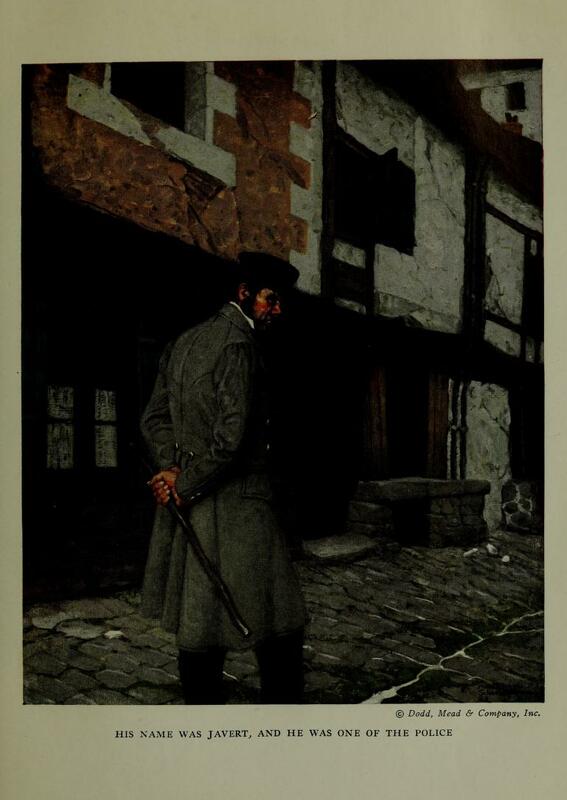 In-text image, depicting Javert, from an English-language edition of Les Miserables, published in New York by Dodd, Mead & Company, Inc., during 1900. Illustration, by Mead Schaeffer, facing page 44. Online via Open Library. Bos, Carole "Les Miserables - Meet Javert - Audio Reading" AwesomeStories.com. Oct 07, 2013. Apr 23, 2019.